One of the ideas behind Blueprint for Football is that of looking at different ideas that are – or should be - influencing the game of football. We’ve done that over the years and here is an overview (shown by order of publishing with the most recent ones being on top) of the most influential of those ideas. There is the belief that great innovations come from lightbulb moments when inspiration hits and the fully formed idea is conceived. That isn’t the case. Instead great ideas are usually the result of years of thinking about something and linking it to knowledge learned from elsewhere. It is for this reason that curiosity is important as it is through it that one accumulates the knowledge needed to thread together different concepts. The most tactically disciplined teams are also those who seem to know instinctively when they should be doing a particular action. Think of Arsenal’s back four under George Graham moving in unison to set-off the offside trap or Pep Guardiola’s Barcelona pressing defenders as soon as possession was lost. The thing is that this is hardly instinctive but rather a movement that is dictated by habits, an idea that every coach has to be aware of. Can you teach a player how to be more aware of what is happening around him? Can you determine how aware a player is of what is happening around him by watching him play? The answer to both questions is yes and Geir Jordet, who has studied in depth the idea of perception provided a breakdown on how this is possible. For coaches looking for some different ideas to investigate, this has to be on their read list. The history of the game of football is littered with players who had the talent but not the mental capacity to succeed. It is a shameful waste considering how much resources there are out there for them to help themselves. As for coaches, they too have to have a good handle of the basics of sports psychology and Dan Abrahams delivered a primer on that in this interview. The idea that the 10,000 hour practise rule is, at best, an indicator rather than a rule that guarantees expertise is now quite accepted but at the time of this interview with the University of Birmingham Senior Lecturer Dr Martin Toms his arguments flew in the face of the pop-psychology beliefs set about by Malcolm Gladwell’s books. A wide ranging interview that delves into the damage that early specialisation does to players and how it would be best to let children try out a number of sports. 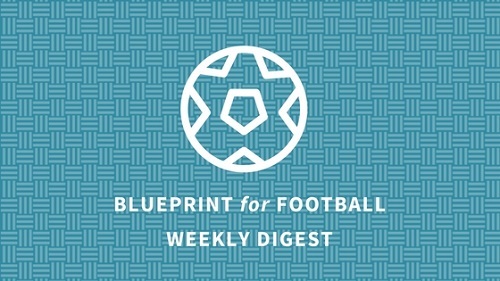 From Bristol Rovers to Barcelona, through Liverpool and PSV Eindhoven, over the years Blueprint for Football has spoken to a lot of people working at the best* football institutions in the world. Their knowledge is yours to experience and here you will find a quick summary of each of the most insightful of interviews that we have done. If you want to read what fellow coaches have to say about their views on the game, check out of Blueprint According To... series or join our newsletter for a free copy of Volume III. * Best for us is defined not purely by prestige but also by attitude and willingness to learn. Although Scottish football has, to put it mildly, not been enjoying the best of times there are still a lot of people within the Scottish game who are top class coaches with ideas for youth development that are quite inspired. Frankie McAvoy is one such person. At the time of this interview he was the Youth Academy Director at Hamilton Academical who had produced players like James McCarthy and James MacArthur. McAvoy has since followed Alex Neil to Norwich but Hamilton still field teams made up largely of home grown players, a sure indicator that they still abide by the same ideology for the development of talent. Although he is not a familiar name among many football fans, Horst Wein has to rank among the best coaches to ever think about the game. His attitude to letting young players learn by playing the game is visionary and in this interview he spoke among others of that belief and how best to achieve it. When he wrote The Nowhere Men, Michael Calvin brought to focus a role that is often mythicized without ever really being understood, that of scouting players. He did this by spending time with a number of scouts and learning from them along the way. Some of that knowledge was passed on in this interview. As the games increasingly appreciates technical players, youth football coaches are being faced with a challenge brought about by the decline of street football where most of those players used to learn those skills. Futsal is a valid replacement and perhaps the way forward. Although Johann Cruyff is widely credited as kicking off the revolution in thinking at Barcelona, the process had actually started under Laureano Ruiz who took over the club’s youth system before Cruyff arrived at the club. One of his first acts was to abolish the policy where only players of a certain height were considered. Universality is a concept where players interchange between positions, where they are not fixed to any role and instead simply rotate with each other in games. It is along the same thinking as total football, the only difference, and perhaps the key aspect for the future game, is that the team is made up of universal players, all with the skills and attributes required to play in any position. In this interview Whitehouse spoke in detail about that concept, why he thinks that football will evolve in that manner and why every football coach should be paying attention to it. 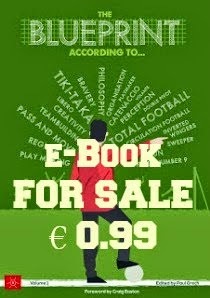 In recent years, philosophy has become something of a buzzword within football yet the real meaning of philosophy within the game was somewhat lost. Lees explained it in detail looking also at his own route to developing a philosophy. Aberdeen have a tradition for bringing through young players and that looks like continuing given the club’s current policy of focusing primarily on bringing through players to their first team, something which they have done successfully. Gavin Levey is the man charged with their younger age groups and he explains how they do it. Although most of the attention is focused on what happens at the highest level, there is a lot of excellent work going on in lower levels. Bristol Rovers are a prime example and in Jonathan Henderson they have a head of coaching who is determined to push them forward. Goalkeepers, it is often said, are different. You have to be when in a game where the ultimate aim is to put the ball between the goalposts you dedicate yourself to stop it from doing so. Ruud Hesp was one such individual but he sees it differently as for him there is no better role than being a goalkeeper. In these two interviews he speaks about his career, the lessons that he learned and what it takes to be a top goalkeeper. "I Never Look For Players Who Take Advantage Of Their Physical Power At Young Ages"
Any coach who has the good fortune of working with Barcelona is bound to have an excellent insight into the game. Albert Capellas has gone further than that, expanding his horizons by working in a number of countries like Holland, Denmark and, now, Israel. This has been an educational experience and he shares some of what he has learned in this interview. A lot of coaches have mentors who guide their formation and towards whom they look as they develop their ideas. Few however can match American Todd Beane who found his tutor in his father-in-law, the legendary player, manager and football visionary Johann Cruyff. He began working with Cruyff in the foundation of the Cruyff Institute – an educational institution aimed at educating athletes, sport and business professionals in the field of sport management - in 2002 and continued his work there until Johan’s passing last year. Memorable Quote: "Intelligence is the foundation of all excellence - within and beyond the pitch. It is more than important; it is imperative." "The coach is the most disposable element in a football team"
Having delivered tiki-taka and a generation of players that dominated world football for almost a decade through a system based almost exclusively on ability, Spain is rightly seen as the home of technical football. Fueling this culture are coaches who bring the ideology to life. Ismael Díaz Galán is typical of this class. His experiences might have been limited largely outside the Primera Liga but he is a deep thinker about the game and a keen educator who is eager to share the vision that lights up Spanish football. Memorable Quote: "I do not hope for a win, I aggressively try to make it happen by keeping hold of the ball more than not; creating a collective intelligence that makes us stronger as a group without diminishing individual creativity." - donate to contribute to more great interviews. As new trends replace existing ones people tend to be blinded by all that is new, discarding lessons that previous successes had taught them. For decades, Liverpool were successful thanks to a group of coaches who balanced each other out. Many tried to uncover the secrets of the fabled boot room and a lot of theories emerged. One aspect that was never looked into with much interest was their practise of noting down everything from scouting reports to training sessions to what worked in different situations. This manual enabled them to have a factual record of why certain decisions were taken and is a practise that every coach today should be looking to copy. Here’s why. How teams can adopt the 3-3-1-3 formation. After what has been, by their standards, a pretty disappointing season Barcelona have appointed Ernesto Valverde as their coach. Valverde achieved exceptional results at Athletic Bilbao – a club with rich traditions, high expectations but pretty unique restrictions on recruitment – and being a former Barca player who played under Cruyff he was always the most obvious choice for the role. Here is a brief introduction to Valverde’s attributes as a coach and his tactical dogma. 44 Awesome Drills That Make Your Body Faster and Your Mind Sharper. Oscar Washington Tabarez – El Maestro – Uruguay National Team coach; World Cup semi-finalist in 2010 & 2011 Copa America winner. The success of clubs like Ajax, Monaco, Atalanta and Southampton who have all exceeded expectations with teams built around players coming through their youth systems does not seem to be rubbing off with most clubs (especially English ones) opting to buy their way to honours. What is particularly sad about such behaviour is that young players are not finding a way through, having their hopes dashed after years of hard work. This article looks at that dark side of the game. One of the hardest tasks facing any coach is that of teaching players how to react during games where not everything is cleanly laid out like a training session. AZ Alkmaar have developed their own way of handing this issue which makes for very interesting reading for any coach. Michael Cox – or ZonalMarking as he is known - was one of the early football writing stars of Twitter through his tactical analysis of games and whilst many have followed in his path, his remains the freshest voice of all. He is now publishing his first book on football tactics (The Mixer) from which this is an extract. It deals with Georgi Kinkladze and how his arrival starting forcing English clubs to look at different tactical solutions. This is the kind of article that makes Jonathan Wilson such a standout among current football writers: a piece about how Antonio Conte adopted an idea that is fifty years old to build his Chelsea team into champions. Brilliant stuff. If you want to read something a bit different, last week I wrote about this on Andrea Fortunato. A talented young left-back who was threatening to displace the great Paolo Maldini in the Italian national team only for tragedy to stop him from fulfilling his destiny. One of the finest football books of recent years is Simon Hughes’ Secret Diary of a Liverpool Scout. It tells the story of Geoff Twentyman who was Liverpool’s Chief Scout between 1967 and 1985, an era that was marked by the club’s unprecedented success built largely on an exceptional ability to identify talent. What marks this book out is how it was written. Rather than being based on the recollections of Twentyman himself (sadly, he passed away way before work on this book had started) it uses the meticulous notes that he used to take during every one of his scouting trips. This was an extension of the practise within Liverpool’s fabled boot room of noting down different aspects of their work from training, recovery and tactical approaches in varying situations. These dossiers eventually became the reference point whenever the club was faced with similar situations allowing them the luxury to judge whether to take a similar approach or not. Bill Shankly took over at Liverpool in 1959 and the boot room was established shortly afterwards. It is testament of how visionary that group of people was that the practices that they adopted are still as effective today as they were more than fifty years back. 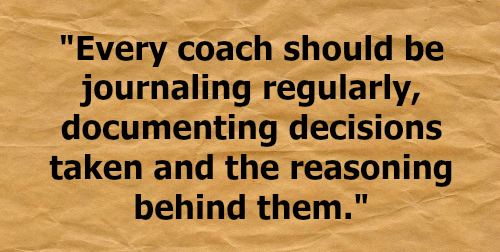 Essentially: every coach should be journaling regularly, documenting decisions taken and the reasoning behind them. To appreciate why that is there is the need to move away from sport and into the realm of psychology. People act in the manner that they do because over the years their behaviour has been shaped by their own experiences. The problem, though, is that those experiences and memories might not include all the details; they might be inherently biased. There will be occasions when a positive result influences one’s recall of a choice or vice-versa. Imagine if someone were to ask you to think back to a time when you missed the train and describe your experience. The odds are that you will recall a negative experience. This will also contaminate any future thoughts that you have and, if that same person were to ask you to imagine how you would feel the next time you missed the train then the likelihood is that you would predict a bad reaction. All this is not conjecture but precisely what Dr Carey Morewedge and his colleagues from Harvard University found in 2005. During their study they asked a set of people to recall the last experience of missing the train, another to recall their worst experience and another to think back three past experience. Their findings showed that those who had been given free reign to think of one experience made the most negative prediction. 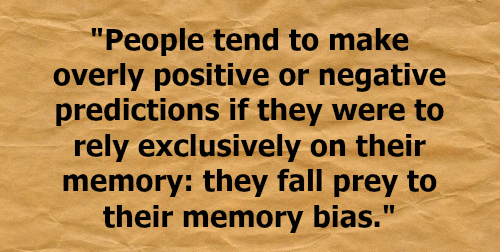 Further studies strengthened this theory that people tend to make overly positive or negative predictions if they were to rely exclusively on their memory: they fall prey to their memory bias. This, clearly, has a number of implications in a football environment. Let’s say that your team was thinking of bringing over a new player who has a particular character trait that might cause issues in the harmony of your squad. If you’ve just come from a good season then you might be swayed into thinking that this too will work out well and that you’ll manage to integrate that player. That might well turn out to be the case but, regardless, that decision was not made on the right basis. 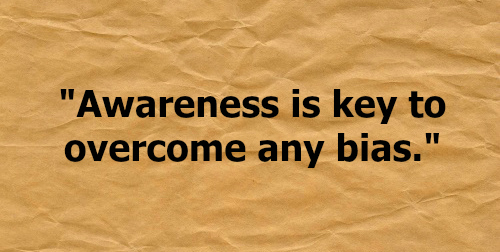 Awareness is key to overcome any bias. In such a circumstance, if a manager has records of previous transfers and thoughts before they were completed then he might notice instances that might be similar to his current situation. Reading them and thinking of how they turned out would probably allow them to make a better informed decision. It makes it harder to justify a certain decision when you have a divergent piece of evidence in front of you. Michael J. Mauboussin is an unikely source to find inspiration for football coaches. He has no history with the game (as far as is public knowledge at least); he is instead the managing director and head of Global Financial Strategies at Credit Suisse and an adjunct professor of finance at the Columbia Business School. There might not be many parallels between those investing in stock markets and people who work in football but both have one feature in common: there are strong emotions in play which might lead one to make terrible moves unless they are fully conscious and aware of what they’re doing. That is why Mauboussin argues over the importance of noting decisions. It is a philosophy based on a discussion with Daniel Kahneman, one of the most brilliant men of our lifetime and who gave birth to the new science of behavioural economics. In particular, Kahneman’s work helped to bring to light a number of biases that influence people’s actions. “Many years ago when I first met Danny Kahneman…when I pose him the question, what is a single thing an investor can do to improve his or her performance, he said almost without hesitation, go down to a local drugstore and buy a very cheap notebook and start keeping track of your decisions.” Mauboussin said in that same interview. While football is a simple game, the decisions made by those who coach or run a club are often extremely complex. Often managers’ reactions during games are quasi-instinctive and heavily influenced not by rational thought but by past actions. Unraveling why a decision was taken can be just as complex. 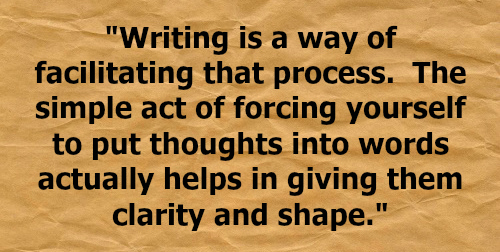 Writing is a way of facilitating that process. The simple act of forcing yourself to put thoughts into words actually helps in giving them clarity and shape. The journal that a coach maintains does not have to be a work of art. To all extent and purposes it can be illegible to anyone but the person who wrote it. There is no need for any jargon or deep, insightful thoughts. Don’t feel under pressure to write something that is great, just write you’re your thoughts. What there should be a modicum of organisation (so that when you want to look back to a particular decision you can find it with ease) along with clear, direct writing that avoids any vague thoughts. Initially it might feel like an unnatural act, it can feel like pretentious rubbish. Push past that resistance and eventually, after a few weeks you will come to appreciate just how important a tool this can be for a coach. After all, if it was good enough for the likes of Bill Shankly and Bob Paisley, it should be good enough for the rest of us. Enjoyed this? Want more? 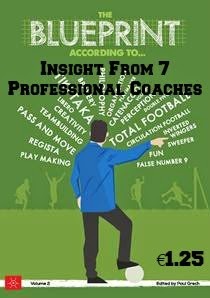 Sign up to Blueprint for Football Extra and as a free bonus you'll get a copy of our exclusive e-book Blueprint According To...Volume 3 that features interviews with six football coaches on how they go about their building their knowledge. Mattia Caldara: remember the name because in a few years he will be considered as one of Europe’s finest defenders. Caldara was one of the standout players in an Atalanta side filled with young players that managed to gain an unexpected qualification to the Europa League. It is one of the greatest stories of the season but, more significantly, it is a great success story of a club that focuses its energy on developing players the right way. It might not have earned them many plaudits or praise but Manchester United put in a performance that allowed them to win the Europa League. Here’s an analysis of how they actually did that. “The most important thing a dad can give a girl is the feeling that she is special. Not his “princess” based on her looks or being somehow better than anyone else, and not because she gets high marks or gold medals for sport, but because she is his daughter, and he loves her just for that.” Some general insight to being a good parent which works very well for those with kids and in sports. Thanks to reader Stephen Murray for pointing me to this article and remarking: "He shows up. He keeps his promises. He is strong, not in the sense of muscular strength, but being true to his word, reliable, and there." isn't that a coaching role model? Coach David Selini has put together a tactical guide to man-to-man marking that is as detailed as anything I’ve seen on the internet. An excellent read for the uninitiated but also loads to learn for those who are familiar with the ideas thanks to his use of practical examples. This has been a magical season for Lincoln City. Not only did they reach the Quarter Finals of the FA Cup but they won the Football Conference National League, hitting ninety nine points and marking their return to League Two in style. The main architects of those successes were the management team made up of brothers Danny and Nicky Cowley. Kevin Graham had the opportunity to spend a day with them them as they went about their coaching duties. These were his observations. Football drills: the full triangle method. Whilst Sevilla have tended to be the ones spoken about when it comes to small Spanish clubs who have made the most of what resources have been available, Athletic Bilbao’s achievements also deserves to be studied. This article, analysing their methods, makes amends. Talking of Athletic Bilbao, this interview with their young goalkeeper Kepa Arrizabalaga – who at 22 years of age is already a first team regular – offers a number of fascinating insights on how his career has developed. Thanks to the Blueprint for Football reader who pointed me in the direction of this interview. “You can lose a game, but what you cannot lose is the dignity earned by playing good football” – Cesar Luis Menotti, World Cup Winning Coach with Argentina in 1978.